Remember Artisan Bread in Five Minutes a Day? Here’s one thing you can do with this dough from the master recipe: PIZZA. And this time I made it on the grill, so I didn’t set off the smoke alarm or have to sweep cornmeal from every surface of the kitchen. I spent exactly five minutes assembling and mixing the dough and putting into a bowl. 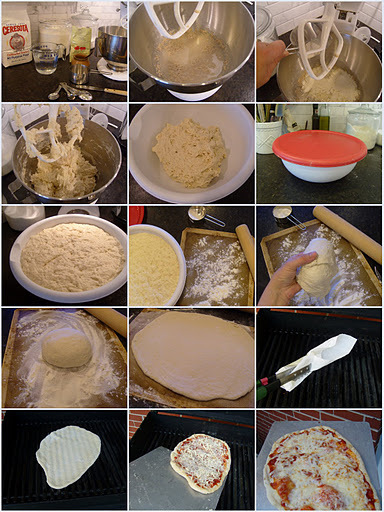 I let it rise about two hours on the counter, and then put the bowl in the fridge.When I was ready to make pizza, I took a handful of dough (about 1/4 of the dough in the bowl) and, using lots of flour on my hands and on the dough, gently stretched it into a ball. Roll it out on a generously floured silpat, prick the dough with a fork a few times, and slide the dough right onto the oiled, preheated (500 degrees) grill rack. At this point, I turned two of the three burners down to low. Close the lid and bake it on the grill for about 3 minutes, or until you start seeing some grill marks and the crust is baked enough to flip. I grilled the second side only a minute or two, and then slid a thin cookie sheet under it and took it off the grill. If I were making pizza for a crowd, I would bake all the crusts up to this point ahead of time, let them hang out on cooling racks, and then put the toppings on at the last minute and slide the pizzas onto the grill, two at a time, just before serving. Again, the grill should be at around 500 degrees, but turn the burners down so you don’t scorch the crust. I think it took another five minutes or so until the cheese was melted and the crust was bubbly and golden. I got the tip about using lots of flour and a silpat from the Artisan Bread blog. There is a ton of great advice to be had from the authors and the commenters over there. But really, it’s hard to go wrong with this dough. Mix it up after dinner, put it in the fridge on your way to bed. Tomorrow all you have to do is roll it out and slide it onto the grill!